Don’t Get Grilled… on Grill Safety! As the weather warms up, we know that a lot of you will be warming up the grill for barbecuing season. But do you know how to prevent your grill from starting a fire? According to the National Fire Protection Association, between 2009 and 2013, there was an average of 8,900 grill, hibachi, or barbecue-related home fires per year. Here are five important facts about grill safety that will make your backyard the safe haven that you want it to be. 1. Be very careful with liquid gas and propane, because they are extremely flammable. The most dangerous type of fuel to use in grills is gas, accounting for 83 percent of all grill fires. Charcoal and other materials account for less fires, but any material can pose a fire risk. 2. You should always make sure to clean your grill properly before and after you use it. Improperly cleaned grills are the leading cause of grill fire. For gas grills, you can use a pipe cleaner to clear blockage in the tubes that lead to the burner. 3. Another leading cause of grill fires that use gas is leaks or breaks that can develop in the gas line. It is always a good idea to inspect the pipes and fuel sources before you fire up the grill. Also, make sure there are no sharp bends in the tubing and pipes which might result in unnecessary stress on the system. 4. Always have proper ventilation while grilling. Do not grill indoors, and be cautious with awnings or umbrellas. If you grill indoors, you are not only risking a fire, but also, suffocation from the fumes produced by gas and charcoal grills. Always use grills at least 10 feet away from your house or any building. 5. If you suspect a leak, be careful. Keep open flames and lit cigarettes away from the grill, and if you suspect that there is a leak, play it safe. 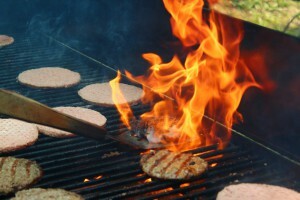 Do not light the grill if you smell excessive gas, or if you notice any abnormalities in the grill’s fuel system. It is important to know the facts behind grill safety. Grilling season is upon us, and we want to prevent as many fires as possible during this high-risk season. Proper fire safety systems are an important part of fire prevention, but safe practices are also crucial to a safe environment. If you have any questions about fire safety, whether you’re grilling at home or at your business, you can contact us at 630-960-5060. Category: Fire News, Fire Safety, Total Fire and Safety Tags: barbecue, barbecue fire safety, barbecue risk, barbecue safety, fire safety, grill fire, grill fire risk, grill fire safety, grill safety, grilling safety | Comments Off on Don’t Get Grilled… on Grill Safety!